For the 20th century first baseman, see Harry Davis (1930s first baseman). For other people with the same name, see Harry Davis (disambiguation). Harry H. Davis (July 19, 1873 – August 11, 1947) was a Major League Baseball first baseman and right-handed batter who played for the New York Giants (1895–96), Pittsburgh Pirates (1896–98), Louisville Colonels (1898), Washington Senators (1898–99), Philadelphia Athletics (1901–11, 1913–17), and Cleveland Naps (1912). Davis with the Athletics, circa 1911. Davis was born in Philadelphia. He attended Girard College. He led the American League in home runs from 1904 to 1907, one of only five players to have ever led their league for four consecutive seasons. He also hit for the cycle on July 10, 1901. He led the AL in doubles three times and the NL in triples once. 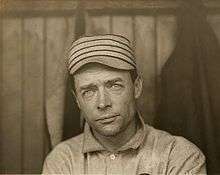 Davis was the starting first baseman and first captain of manager Connie Mack's Philadelphia Athletics from 1901 to 1910. In 1905 he led the American league in home runs, RBI, runs and doubles, and led the Athletics to the 1905 World Series against the New York Giants. He was the starting first baseman for the 1910 World Champions and hit .353 in the 1910 World Series. 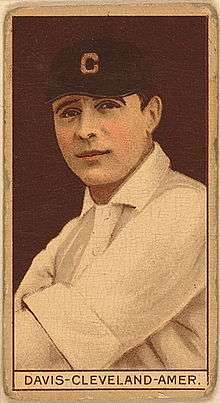 In 1911, the 37-year-old Davis was replaced at first base by the younger Stuffy McInnis, and Davis played a reserve role for the 1911 World Champions. Davis managed the 1912 Cleveland Naps, but left with 28 games left in the season and a record of 54–71. He returned to the Athletics as a player/coach in 1913, amassing only 33 plate appearances over the next five seasons combined. He continued as a coach and scout with Mack's Athletics until 1927 and also served as a Philadelphia City Councilman. Davis died in Philadelphia, Pennsylvania, August 11, 1947, at the age of 74. ↑ "Harry Davis". Baseball Reference.com. Retrieved 24 March 2016.